Colin Ingram hit an unbeaten century to propel South Africa to an easy 125-run win in the first One-day International on Sunday as Pakistan fell way short in the chase. Ingram scored 105 off 104 balls as a full strength South African side posted 315 for four to set Pakistan a tough target despite improving batting conditions. Pakistan managed only 190 in reply, bowled all out in 36.2 overs. The result provided a major boost for the home side, who despite their top test status have recently struggled in one dayers as they experimented with their line-up. "It was exciting to see the guys perform like that. 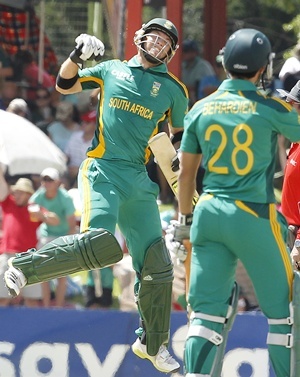 We've not exactly being doing well in the one day arena of late," said captain AB de Villiers. Ingram's ton was ably supported by decent knocks for all five of the other South African batsman, particularly a swashbuckling 34 off 14 balls from Farhaan Behardien. Ingram and de Villiers put together a 120-run partnership for the third wicket after openers Graeme Smith (30) and Hashim Amla (43) had laid a decent foundation before being dismissed in quick succession. Pakistan failed to get any momentum in their reply despite an opening stand of 42 in the first seven overs before Nasir Jamshed (25) was caught behind. Fellow opener Mohammad Hafeez can feel hard done by after being given run out by the third umpire. Television replays failed to provide conclusive evidence that Rory Kleinveldt had deflected a drive from Younus Khan on to the wickets that caught Hafeez out of his crease as he was backing up. A late cameo from Shahid Afridi, who hit one six well out of the stadium as he smashed 34 off 16 balls, came too late to rescue a regular fall of wickets as Pakistan slipped behind the required run rate. "We didn't exploit the condition early on or when the wicket became easier," admitted captain Misbah-ul-Haq. The two teams, who are also preparing for the Champions Trophy in June, continue the five-match series at Centurion in Pretoria in a day-night encounter on Friday.